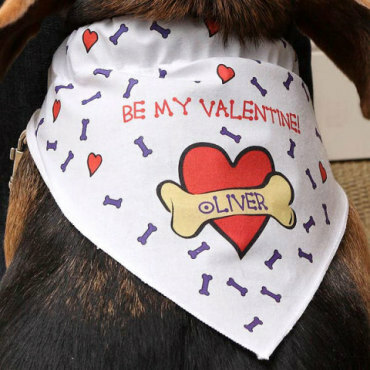 14 MORE Cool Ways To Adore Your Dog On Valentine's Day! I always have such a difficult time cutting back my holiday gift columns for dogs, and this Valentine's Day is worse than ever. Cute just does not take a rest! Isn't this a killer dress? 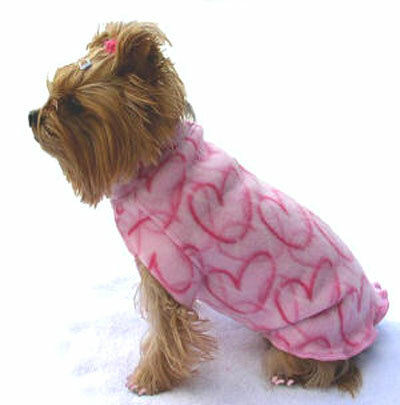 The 3-piece Flirt outfit has that tough but feminine look every fashionable dog wants. 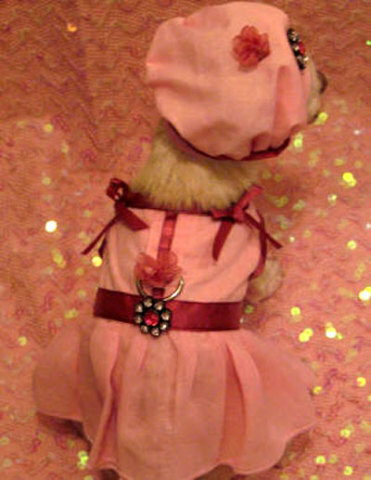 Here it is, ready for Valentine's Day, complete with beret, dress, and matching leash. At My Pet Haven. If your dog is chewing up your underwear, buy her a thong of her own. This Leopard Thong is just perfect for Valentine's Day; it's leopard, black laced, has a sweetheart bow, and a squeaker inside! At Chimpfeet.com. 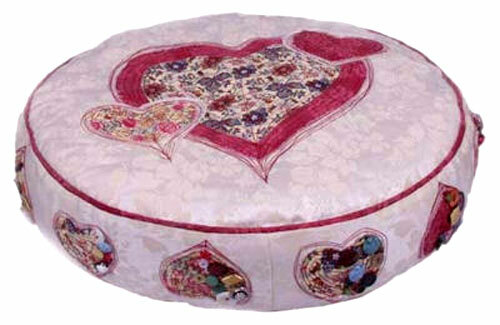 This very unusual dog bed looks handmaid, with its embroidered hearts and buttons on an ivory brocade background. Has a 25" diameter. Very pretty at Blooming Tails Dog Boutique. See what I mean about cute never taking a rest when it comes to Valentine's for pets? 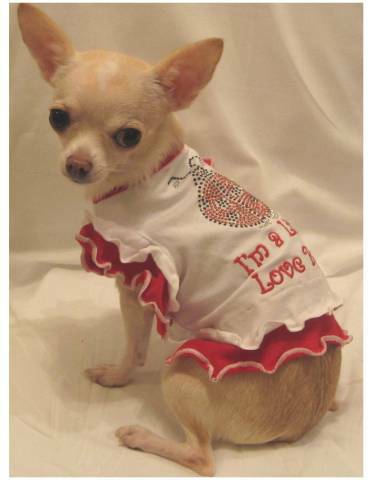 I'm A Little Love Bug" epitomizes cute with its double ruffle cotton spandex body and the big lady bug (?) on the back. At My Pet Haven. 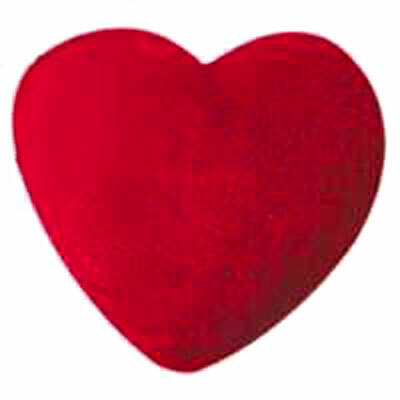 Plush heart will tell your pup all year long how much you love her; it actually says "I love you," when she presses it. My pup's Heart Throb is still talking after a few years of his "ventriloquist" act. At Amazon. 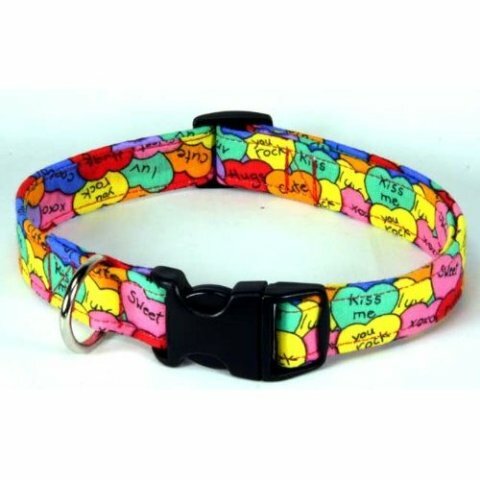 Here's a joyous candy heart collar that your pup can wear all year long. Cotton on nylon webbing. At Amazon. and female versions and can be personalized for your dog. At My Pet Haven. wheat flour and chicken livers! Yum! 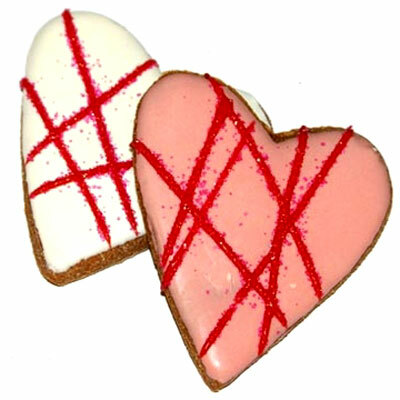 Made with love at Perky Paws Cafe. I'd like to wear this one but my little bee neckline's a bit too narrow. 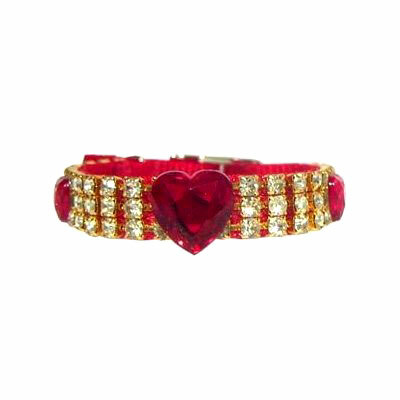 The sparkle in this collar will only be matched by your sweet Valentine! At Amazon. 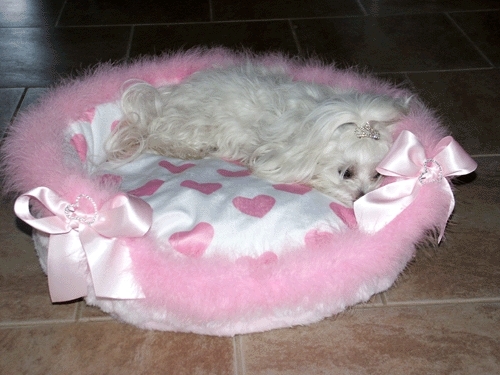 Pink "mink" trim, satin bows, and crystal hearts surround the center pillow that's machine washable! Charming! At Handsnpaws. unambiguous. 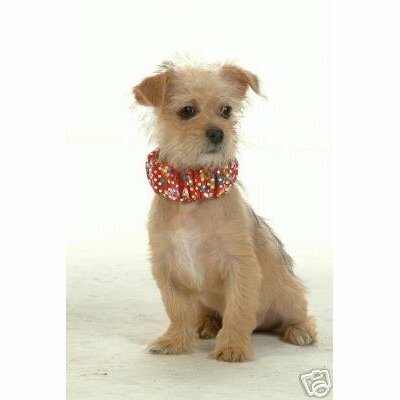 He'll be everyone's valentine, in this cotton 19" x 12"
bandana that fits right over his collar! At Personalization Mall. When your pooch only understands one kind of love (food), you have to go all out on Valentine's Day. 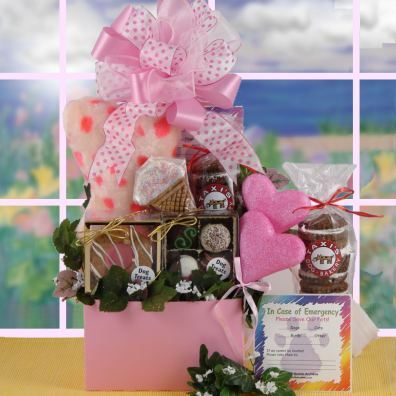 This big basket of dog treats includes a Pooch Party Cake, Freeze Dried Ice Cream, Bow Wow Carob Bar, Huge 5 Hand Cut & Decorated Ice Cream Cone Biscuits, Gift Box of High End Bon Bones Bakery Designer Biscuits, and a Mega Bite Peanut Bon. Valentine theme at Amazon. (hidden by the ribbon) for hooking up on Valentine's Day! At My Pet Haven.